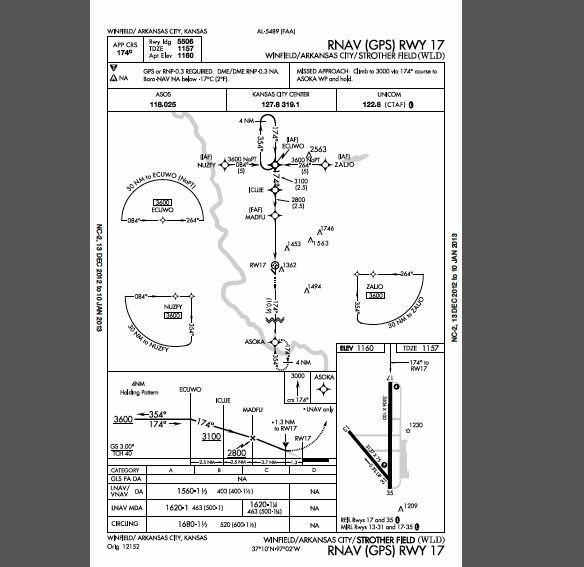 Let’s look at a scenario approach and how you could fully automate the descents: RNAV (GPS 17) @ KWLD Let’s assume you’re at 4,000 ft in a G1000 equipped airplane with the GFC700 autopilot. Autopilot is currently flying in GPS & ALT modes. Arming the approach adds the GP to the autopilot status bar so it is ready when we intercept the glidepath. In the mean time you could either manually descend to 3,600 upon reaching ZALJO, or just let the VNAV do the descents for you. In this case, let VNAV do the work. The TOD probably lies somewhere between ECUWO and ZALJO. When you are 1 minute out from the TOD, you hear “Vertical Track”. This is our reminder to select the altitude and arm VNAV. Normally we would select the next altitude, but for this specific scenario, you can actually set 3100 (Refer back to item #7 above). The autopilot now shows something like “GPS /// AP /// ALT GP/V”. Everything is now automated for the rest of the approach. The only step left is to manage power & configuration, enjoy the ride, and disconnect the autopilot and land… But I’ll go ahead and walk you through the progression of what happens with the Garmin. The autopilot captures the Vertical path at the TOD (annunciated as VPTH on the status bar). While on the VPTH the armed (white) modes would be a condensed version of ALTV & GP. The ALTV indicates that the autopilot will level off at the VNAV BOD altitude of 3600 ft (@ ECUWO) rather than the selected altitude of 3100 ft. There is no need to re-arm VNV for the next descent to ICUJE. Your altitude bug is already set. VNV is still armed from the last time you pressed it, and it will capture when it reaches the second TOD. Autopilot captures the vertical path once again, and continues down to cross ICUJE at 3100 ft. Passing ICUJE, VNAV goes away, and the glidepath is now available. As the aircraft intercepts the glidepath, GP captures on the autopilot and the airplane continues down the approach. By the way, the autopilot ignores the altitude bug once it intercepts the glidepath or glideslope, so putting your altitude bug on the minimums doesn’t accomplish anything…(The autopilot will fly you into the ground unless YOU intervene.) Instead use your minimums bug for your visual reference on your minimums and use your altitude bug to select the highest altitude on the missed approach. NOTE: Please note that this approach is not the typical GPS approach since it has the additional ICUJE fix, whereas most GPS approaches wouldn’t have anything in between ECUWO and MADFU. It is simply used to highlight a few special points on VNAV usage as it relates to WAAS approaches. Keep in mind this type of VNAV use should only be attempted once you are fully comfortable with what to expect, and have fully briefed the approach. This method of flying an approach is simply an option – not a requirement. If you don’t have time, just cancel the VNAV and fly the approach like you always have. Don’t get so wrapped up in the avionics that you sacrifice safety or lose focus. Fly the airplane first! Everything else is secondary. Another great resource is the Garmin G1000 PC Trainer. This allows you to try out everything on your computer rather than in the plane. If you have any questions in regards to this topic, just leave a comment below or find us on Facebook!